Soo . . . I know these pictures seem to look the same. That’s because I did this in my backyard, which was NOT a super great place to take pictures because it’s super cluttered and has too much out-of-proportion junk in the background, so I zoomed in a lot. Plus, for this photostory, the dolls don’t move much, which resulted in not-so-great shots . . . which is why I haven’t posted this yet. I took the pictures a month or so ago, and I wasn’t really happy with it. But the script is pretty funny, so maybe you’ll like it anyway. Also, you guys were so sweet in the comments in my last post! I’m glad to be back from my never-announced hiatus. In case you missed my announcements, I am now a part-time public schooler, meaning I am not as home as much as I used to be. Plus, skiing just started today, so I don’t get a whole lot of free time this year. I will try to post as much as possible, though! And now . . . onto the photostory! “Hello, everybody, and thanks for coming to the family meeting!” I greet my sisters. My sisters stare at me blankly. “Oh, I got an A++ on my calculus quiz!” Molly shares exuberantly. “What a shock,” Crystal yawns, leaning back on AGs in Alaska’s pallet fort. Too late. Crystal runs into the house at the speed of lightning, returning with a turquoise guitar haphazardly strung around her neck. And then promptly hits the ground. “You okay there, Crys?” I ask, concerned. The poor dear will prombably start complaining about her smudged makeup any second now . . .
“I’m fine!” Crystal answers, popping back up. “Ready to hear my song?” She begins to sing rather off-key. I grimace. The rest of my sisters are having the same reaction. “Maybe some voice lessons or something . . .” I mutter. Belive it or not, I’ve had Tenney’s guitar since April, when I visited the AG Place Dallas. Since then, I’ve collected a few more musical instruments, which may appear in upcoming posts . . .
I’ll check back with you guys later. Have a great Sunday! Morgan: Why hello there, peoples of the universe! It’s Morgan here with a VERY special edition of The Dog Blog – this time featuring not a dog, but a bunny! Everyone, please welcome Mischief, Tessa’s rabbit. We’re making AGIA history here, folks! Morgan: So, Mischief, you’ve quite new to the family, huh? Mischief: That’s right. I’ve been here for a couple weeks now. Morgan: And have you liked it here so far? Mischief: Yes, everybody is so friendly. The girls – well, most of the girls – are gentle and always handle me with respect. Morgan: You said most of the girls? Which girls aren’t gentle with you? Morgan: I see . . . I’ll have to talk with her about that . . . moving on . . . I thought you would be able to bring some new ideas to the table, since most of the animals I interview are dogs. Now, I love dogs, but all they want to do is play fetch. What activities do you most enjoy? Mischief: Cuddling is great! Tessa is so nice about giving me lots of pets and attention. I also like it when she lets me out of my cage so I can run around. It’s so nice to stretch my legs and do binkies. Morgan: Binkies? What are those? Mischief: Here, take a look . . .
Mischief: They’re great for releasing pent-up energy after being in a cage. Morgan: So to you, is your cage a jail cell, or a home? Mischief: Definitely a home. Sometimes, I’ll hop right back into my cage because I’m not in the mood to play – I’d rather relax in my house. Besides, Tessa keeps it so clean, why would I not want to be inside? Morgan: Right? Now, Mischief, we got a lot of comments on our post about your great escape. Can you tell us what led you to jump out of your cage and attempt to run into the road? Mischief: What can I say? Freedom . . . not that I don’t love this family, though. I just saw some yummy dandelions, and I just had to go. Morgan: *chuckles* I get it. What about your favorite foods – do you have any of those? Mischief: Oh, all sorts of veggies. Carrots are my favorite, of course, but those are so high in sugar, so I only get them once a week. Instead, Tessa feeds me celery, dandelions, and bell peppers. Morgan: Is all you eat vegetables? Mischief: Oh, no. Timothy hay is extremely important for roughage in bunny diets. In fact, 80% of a bunny diet should be hay. 10% is veggies, and the last 10% is hay-based food pellets. Morgan: Fascinating! One last question: are you friends with Moe, AGs in Alaska’s rabbit? Mischief: We’ve hung out a few times, and let me just say that that rabbit has . . . a lot of personality. I’m sure we’ll get to be good friends, though. Morgan: I sure hope so. Thank you so much, Mischief, for joining me today! Mischief: Thanks for having me. I’m very excited to be a part of this family. Morgan: That’s all for now, folks! Let us know in the comments which pet you would like to see featured next! Disclaimer: AGs in Alaska is not responsible for your rabbits nutrition – the bunny diet above is what she feeds her bunnies. Please take your veterinarian’s advice in choosing what to feed your own rabbit. Hey guys! Sorry for no post last week – all the posts for the weeks before that were scheduled (and tbh that’s probably the only reason posts from me actually appeared in your dratted Reader). I have a fun photostory for you today, featuring Tessa and Morgan (and Emily! ), who you guys said you wanted to see more of on my poll. Now, without further ado . . . onto the photostory! “Mmm, delicious,” I say aloud and I pick a ripe pea from a branch in our garden. The early September sun beats down on my back, reminding me of the great weather we’re having. My sisters swear that snow is just around the corner, though. The leaves rustle and I turn my head to see Morgan and Emily approaching. They’re both sporting big smiles – which is unusual for Emily, the quietest of all the girls. “Hey Tessa! What’s up?” Morgan asks with a wave. I stand up, curious to see what Morgan is so excited about. We follow Emily out of the gate and turn the corner. Knowing these two sisters’ personalities, there’s probably not something like a snake or tarantula inside the cage, so I grab the handle and pull it open. Inside the cage is the sweetest, most adorable bunny I’ve ever seen. He’s fluffy and white with big brown eyes and a twitchy pink nose. “Go on, pick him up,” Emily urges. I ben down and try to scoop the bunny out of his cage. That’s not exactly what happens. The bunny hops out of his cage and sniffs the air eagerly. “Noooooo!” Emily shrieks, which is the loudest sound I’ve ever heard her make. The fluffy white creature jumps over the ledge bordering our garden. He’s faster than I thought! “You get back here, mister!” Emily commands. The bunny, not having a full command of the English language (or even partial command), makes no move to listen to her. The little bunny continues his journey across our front yard. He hops off the sidewalk and into the street. I gasp. There’s a car coming from a block away! All of a sudden, Emily jumps in front of the bunny. Emily carries the litle lagomorph to his hutch and sets him inside carefully. “No kidding,” Morgan agrees, plopping down onto the grass. She’s panting hard and her hair is a mess. Ta-da! There you are. Tessa now has a pet. Fun fact – I actually picked Mischief out in Dallas at the AG store, but I haven’t gotten the chance to actually put him in a phostory since then. Catch you guys next week! What do you think of Mischief? What’s your favorite AG pet? Do you like bunnies? Happy Independence Day, everyone! Today is one of my favorite holidays for several reasons – food, family, fun, freedom – and photography! That’s why I’m teaming up with Chachel from her awesome art blog, Wild Sketch! Chachel, also known as Rachel, does amazing DIY tutorials, shows her beautiful artwork, and posts pictures of her adorable cat, Gosha. Go follow her lovely blog right now! It’s actually kind of funny. My first photoshoot was a 4th of July photoshoot I did last year, and here I am with another one. Kind of sentimental, when you think about it! Chachel and I decided that for our collab, we would take patriotic pictures for the 4th. I dressed up my dolls in red white and blue outfits and took them into the backyard for a patriotic photoshoot. Here you go! Happy Independence Day! And make sure to check out Chachel’s blog here! Which picture did you like the most? What are you having for dinner today? Does your town do fireworks? Are you going to check out Chachel’s blog? Let’s chat in the comments! “Explosive” hairstyles! Sorry, I couldn’t help it. It’s hard to think of an Independence Day adjective that lends itself to hairstyles. That’s the best I could do. This hairstyle is ridiculously simple to do, contrary to its complicated appearance. It’s one of my favorites! Supplies: Long-haired doll, six hair ties (DO NOT USE THE TINY PLASTIC ONES, THEY ARE IMPOSSIBLE TO GET OUT!!! ), a hairbrush (I know, it’s not AG doll kosher but McKenna needs a new wig anyway, and a spray bottle (optional). Step 1: Brush your doll’s hair backward, making it so that there is no part. Step 2: Make a ponytail at the crown of her head. Step 3: Split the red ponytail in two. Step 4: Take the left side of the red ponytail and grab a section of hair from the left side of her head, combining them into a white ponytail. Step 5: Repeat on the other side. Step 6: Split the white ponytails each in two, then take the inside sections and combine them into a blue ponytail. Step 7: Take the outside section of the white ponytail and grab a section of hair from the left side of her head, combining them into another blue ponytail. Step 8: Repeat on the other side. Ta-da! Beautiful and very patriotic! Ready for a backyard barbeque! This hairstyle is totally adorable, and feel free to make it messy and fun! And there will still be hair sticking out of the bottom, if your doll has SUPER short hair like Lindsey. But I like it that way, it’s playful. Supplies: Short-haired doll, two hair ties, a hairbrush, and a spray bottle (optional). Step 1: Part her hair down the middle and tie off one section. Step 2: Take a small section from the front. Step 3: Split it into three sections and begin French braiding. Step 4: Tie it off into a ponytail around her ear. Voilà! Ready to play in the sprinkler! Supplies: Doll, hair tie (not shown), headband, spray bottle (optional). Step 1: Separate a small section of hair from the side of her head. Step 3: Slip on the headband, and you’re done! I hope you enjoyed these hairstyle tutorials! 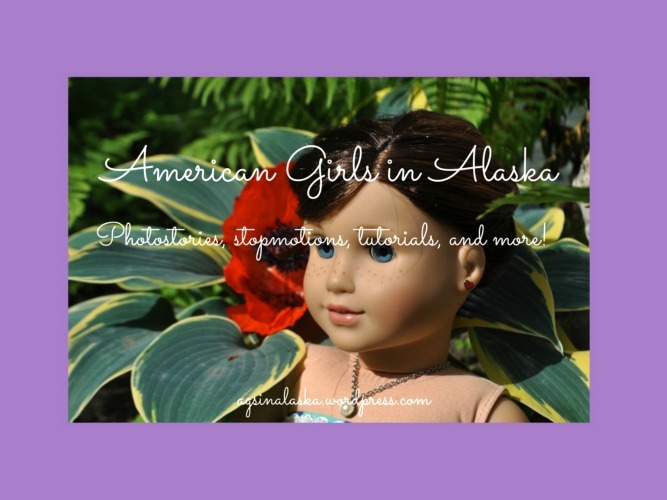 If you try any, make sure to email me at americangirlsak@gmail.com with some pictures! I’d be happy to post them on my blog. Have a fabulous Independence Day! “That would be us,” Linsey says. We all stand and clear our throats. “And now we would like to welcome Morgan to the stage. She is going to be our “pastor” for the day,” Grace announces at the end of the song. Happy Easter, everyone! I hope you enjoyed that photostory. Do you believe that Jesus is alive today, and will forever be alive? I do, and I hope you do too! Trying to carry all my dolls downstairs . . .
Hello, everybody! Today is a very special day – I am doing my first collaborative post ever with the very special Elysium from An Author’s Odyssey! As you um, may have guessed from the title? In case you have never checked out Elysium’s blog – um, hello, WHYAREYOUSTILLHERE????? Go check it out and follow! Her blog is all about writing and she posts writing prompts every Sunday, as well as an example short story every Tuesday. I really look forward to her prompts, and I know you will too! So check it out here and be sure to follow! The way our collab works is Elysium and I agreed on a prompt and my dolls are each writing a short story to go along with it! The prompt we chose is “Worst Fears.” And without further ado . . . here are the stories! “I cannot wait for the dance tomorrow!” Jess giggles excitedly. “Me neither,” I tell her, swinging my bundle of shopping bags. Jess and I are at the mall, shopping for Spring Formal. We’re both freshmen, so this is our first one. My best friend and I both love clothes, so we’re downtown at the mall today, picking out the perfect dresses. We head into the cooking store, where my mom is looking for new cake pans. “Ready to go?” she asks, setting down a tree-shaped pan. Jess and I nod, and we all head out to the parking garage. As we reach our car, I can tell that something is completely wrong with the car. The windshield is cracked, and there’s glass all over the front seat. “What do we do, Mom?” I ask her. “Well, I’ll have to call Safelite and have someone sent over to replace the windshield,” she says. She pulls out her phone and makes the call. Jess and I set our bags down while we wait near the entrance to the parking garage. The Safelite repairman shows up and has the windshield replaced in no time flat. We load the bags into the backseat and set off for home. Fifteen minutes later, Jess and I head into my room to put on our dresses for my mom, who’s dying to know what they look like. I reach into my bag and feel something sitting on top of my dress. It’s fluffy and prickly at the same time. I peer into the bag. Staring up at me is a giant orange and black tarantula. “AHHHHHHHHHHHHHHHHHHHHHHHHHHHHHHHHHHHHHHHHHHHH!!!!!!!!!!!!!!!! !” I shriek. Jess leaps off my bed, and I can hear Mom pounding up the stairs. “What is it?” my BFF asks, looking panicked. “Tarantula . . . in my . . . bag,” I stammer. “What on earth is going on in here?” Mom asks, bursting into my room. Mom calmly picks up the bag and takes it downstairs, where she opens the front door and walks into the road. She places it on the ground and tips it over carefully. The tarantula crawls right out and heads off down the street. We look at each other and burst out laughing. “Are you ready, Chelsea?” asks Kayla, the stage manager. “Ready as I’ll ever be,” I reply. I smooth out my tutu and paste a smile on my face. “Nervous?” Tommi, one of the other ballerinas, asks. “Right,” she says, as the music swells and the curtain goes up. Don’t trip, I think to myself. Falling flat on my face would not be a good start to the Christmas performance for my ballet company. The music sweeps me up and I twirl across the stage, pointing my toes and fingers and smiling at the audience. Perfect. No mistakes . . . so far. And then, a little while later, it happens. Halfway through the first act, while doing a double pirouette, I trip and fall backwards. The audience gasps. “Are you okay, Chelsea?” Tommi asks out of the corner of her mouth as she twirls by me. I manage a small nod as I get up. I’m ruining the ballet! Unfortunately, the accident completely throws me off and I trip several more times during the play. By an act of grace, I don’t fall over again. When the curtains finally close, I rush off the bathroom, humiliated. What an disaster! A confident expression on my face, I pass the ball to one of my teammates. She dribbles it up the field and passes it back to me. I near the goalie. She looks at me fearfully, not wanting to get hit in the face. I pull my leg back, preparing to kick the ball into the net. All of a sudden, a tall girl swoops in from the right and steals the ball right from me. Before I can recover, she’s already out of reach, passing the ball back and forth to her teammates. They get the ball all the way over to the other side of the field, and the girl kicks the ball right into the net. Our goalie makes a desperate attempt to keep it out, but it fails miserably. The girl’s team erupts in cheers, and half of the fans in the stadium get up on their feet and scream loudly. I can’t believe it! They just won the game! I kick the grass dejectedly, a few of my teammates coming over to tell me it wasn’t my fault. But, of course, it totally was. No matter what they say, I can’t escape the truth. I just failed my team. We can’t go to state championships now. “I’ll be caweful,” Bea lisps. She carefully climbs onto the roof of the shed, about eight feet off the ground. I follow her up. We perch on the black roof, heated from the sun. It’s a warm July day, perfect for being outside. My eyes go wide as I realize what Beatrice is about to do. “Bea, no!” I shriek, reaching out to grab her pink cardigan. My hand brushes the soft fabric an instant too late. She’s already plummeting to the ground. “Beatrice!” I cry, sliding down the side of the roof. I race up to my little sister. “Beatrice, can you hear me?” I tap her arm. Still no reply. I whip out my cellphone and dial 911. “It’s okay, Emma,” Mom says, wrapping me in her arms. She smells of cinnamon and lavender. “But it’s my fault she broke her neck,” I sob. I nod and stand up, smoothing out my skirt. A nurse leads me and Mom to Beatrice’s hospital room. The nurse opens the door, and my eyes are instantly drawn to Beatrice’s pale face, a start contrast to the bright blue sheets she’s lying on. “Hi, Emma,” Bea whispers softly, her eyelids fluttering open. “Bettew, now that you’we hewe,” she saying, gripping my pinky. “I love you too, Emma,” Bea replies before drifting off to a peaceful sleep. Dead silence in the crowd. Snickers from the audience. Several kids elbow each other and point to me. I look out at the audience, who give me confused looks in return. What did I say? I think. I play back my last sentence in my mind. I start to get dizzy. Imagine them as underpants, I think. Underpants. I suddenly imagine Captain Underpants flying across the audience. My head starts spinning. And then everything goes dark. I wake up a few hours later in my bed. “What happened?” I mumble to no one in particular. I flip my history test over and write Elizabeth Thompson and the date at the top before looking at Question 1. Which pharaoh unified Upper and Lower Egypt? I circle B) Menes without hesitating. Easy-peasy. I pause. Cats? No, that’s Bastet. Water? The more I think, the more confused I get. Five minutes passes before I realize, so I decide to move on to the next question. I know it’s not Memphis – an Egyptian city – or Nile – the famous Egyptian river – so I have it narrowed down to B and D.
Unfortunately, I don’t remember my history class ever going over the old name for Egypt, so I’m lost. I glance up at the clock. Thirty minutes left . . . and I have thirty questions left. I hurry through the rest of the test, only confidently knowing a few of the answers. I take an educated guess at some, but lots of them I don’t remember ever studying. The next day, my history teacher passes back our tests. A big fat D- glares at me from the top of the page. I cringe. This is the worst grade I’ve ever gotten. Diced tomatoes. Olives. Black beans. I mix the ingredients into a simmering pot, humming to myself. This is going to be my best chili yet! “You got it, Ti­a,” I confirm. “A new recipe, too! I dish the chili into bowls, passing them off to my older sister, Alejandra. She swoops out of the kitchen to deliver the chili to our customers. “What spices did you use?” she demands. Humiliated, I follow Alejandra to the front of the restaurant and apologize for the awful chili to everybody Alejandra served it to. “It’s not funny,” I grumble. “Are you excited for your new pottery class?” Grandpa asks, pulling into the community center’s parking lot. “Well, have fun,” he says. I kiss him on the cheek and race inside the community center. “Thanks,” I reply, opening the door. “You’ll be working in Group B,” Mrs. Wong informs me, leading me over to a table filled with girls my age. Perfect. New friends! “Um, hi,” the girl replies, raising an eyebrow in the direction of the girl sitting next to her. They both roll their eyes. Okay . . . so maybe they aren’t the friendliest girls in class. Whatever. A little while later, while we’re working with fresh clay, I try again. “Hi, I’m Cara,” I say to Â a girl across the table. “Hey, wassup?” she replies in a bored tone, looking up for only half a second before returning to her work. I sigh, feeling dejected. This isn’t working out. After class, I pack up my stuff and thank Mrs. Wong, telling her I’ll see her next week. I head out of the classroom and down the hall to lobby. I check out at the front desk and walk through the sliding glass doors. As I’m walking down the path to. the parking lot, I hear giggles in the bushes next to me. Through the tall plants, I see several blonde ponytails. The girls from class. “Did you, like, see her? Talking to Alexa?” one of them giggles. “What a dork,” her friend replies. “I cannot believe she actually tried to talk to me!” a third voice exclaims. Tears filling my eyes, I race down the pavement and out to Grandpa’s car. “How was it, Cara?” Grandpa asks. Grandpa pulls out of the parking lot. I take one last look at the community center, determined to never come back. Which story did you like the best? Are you going to check out Elysium’s blog? Based on their stories, can you guess which fear each doll has? Do you like writing short stories? If so, check out An Author’s Odyssey! All content on this blog belongs to AGs in Alaska, including text, images, etc., unless otherwise noted. Do not steal. If you would like to borrow images, please contact me from my contact page beforehand for permission.